Instead, she studied photography, dabbled in jewelry design and learned how to do makeup. Her ah-ha moment came when she was hired to do hair and makeup for a commercial shoot where everyone on set was amazed at the transformation. So she went to beauty school with the intention of becoming a multicultural hairstylist just like her mother. Still, she struggled with the realization that “clients wouldn’t come to you if you didn’t look like them.” Inspiration came from Keya Neal, an artist, educator and master colorist with the American Board of Certified Haircolorists, who brought her Texture vs. Race Summit to New Orleans. Before she opened Chissel’s Beauty Studio in 2015 in Metairie, the largest community in Jefferson Parish, Chissel worked on commission in traditional salons and often under someone else. Then clients started complaining. Oh, not about her services, which they loved, but about not being able to see more of her. 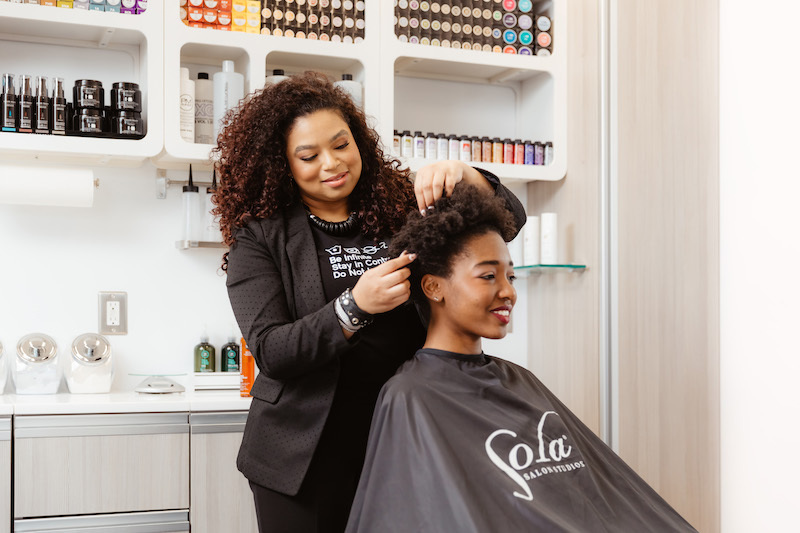 “They wanted more one-on-one time with me,” says Chissel, who found Sola Salon Studios to be the answer to a question she hadn’t even been asking: How can I give my clients a better salon experience? Chissel admits that when she made the decision to open her salon, she was waiting for the “catch, the small print” and was pleasantly surprised when there wasn’t any. “It was move-in ready. All I had to do was bring my supplies.” Chissel likens Sola Salons to owning a condo instead of a house, which is a brilliant analogy when you come right down to it. While Chissel still hands out business cards to clients, who use them to refer their friends, she finds that most of her new business comes from Instagram. To make the most of social media, she monitors her posts to see what the audience responds to, say, posting “after” photos only on one day and “befores” and “afters” with step- by-steps the next. “I’m always looking for hashtags that promote what I do to generate business,” says Chissel, who has uses #curlyhairspecialist to her advantage. So Chissel’s plan is to continue with Sola because they give her a platform where she can grow as a stylist. “I’m not only part of the Sola family but part of the larger beauty community,” says Chissel, who plans to move into a double or two-room studio within five years, which would allow her to hire an assistant, and if she moves into a triple eventually, she can hire another hairdresser to work for her. Case in point: Chissel took over Sola’s Instagram account for one day this week, posting photos of her studio and offering advice on their corporate page. Now that was huge, but she was more than up to the task.